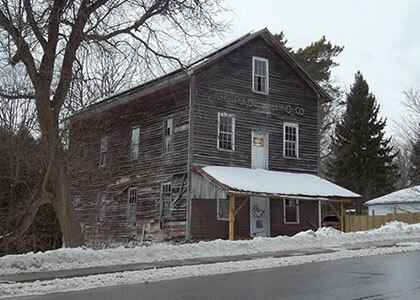 Joseph Abbot Keeler, the founder of Colborne and Castleton, built the old mill known to Castleton locals as Purdy’s Mill between 1825 and 1850. The Mill was sold to the Purdy family about 1875. The Mill’s original, unique millstones were imported from Paris, France, and were known for their hardness and ability to retain a sharp grinding edge. They were used until 1906 when a metal grinder replaced them. The Mill mechanism was driven by the damming of Piper’s Creek, located behind the Mill, which created a 30 foot fall of water. In 1980, the dam was washed out in a severe rainstorm..
G.W. Pinnock is listed as a general merchant in Castleton, in the 1865 Gazetteer. 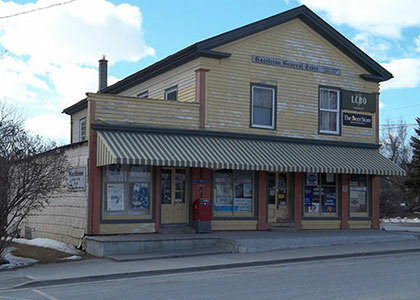 The Castleton General Store was built about that time and Pinnock operated it for 25 years until it was sold to the Newman Family in 1890. Newman ran the store under the name The Newman Company until 1976, when it changed hands again. The store operates to this day and still contains some of the original counters and display cases. It is renowned for its summer lineups for ice cream. The Crown Patent for the land upon which the Castleton Town Hall stands, was issued to the Canada Company in 1830. 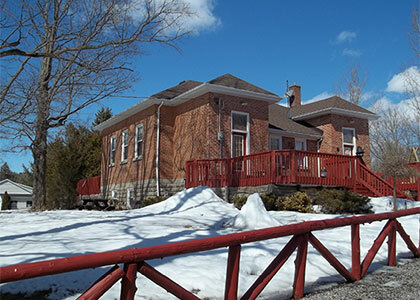 Sixty years later it was determined that Castleton was sufficiently established to require a town hall, and the Township of Cramahe bought the lot in 1892 for $150.00. The building was completed in 1893 by George Crowe of Trenton, at a cost of $3,900.00. 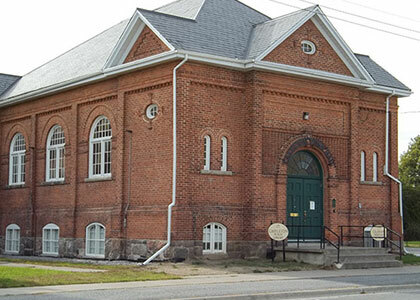 The municipal office, jail cell, vault and Council Chambers were located downstairs. A concert hall with the original balcony is still situated on the upper floor. Timothy S. Giroux, a hotel keeper from Norham, built this “frontier” styled building in the 1890s. The Oriental Hotel, which was also known as the Temperance, Union and Castleton Hotels over its lifetime, was host to traveling salesmen, bankers and entertainers. In the 1920s, the then Union Hotel charged 50 cents a meal and 1 dollar a night for lodging. At one time, the Oriental became home to the Canadian Imperial Bank of Commerce and the township library. It is now a private residence. In the 1880s this red brick Gothic Revival cottage with its multi-paned lancet window, was home to Michael John Doyle, an agent and assessor. 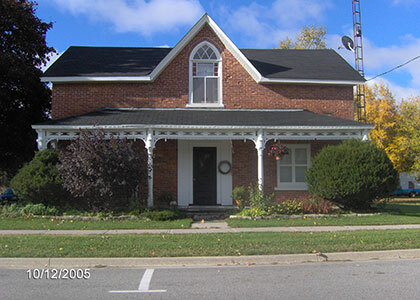 Doyle was a former reeve of Cramahe Township as well as Warden of the United Counties of Durham and Northumberland. 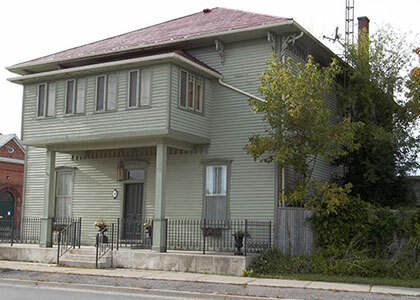 Influenced by the spirited political discussions in her childhood home, Doyle’s daughter Iva, later Mrs. Howard Fallis, became Canada’s first Conservative female Senator, in 1935, under Prime Minister R.B. Bennett. (The house was covered in siding in 2015). 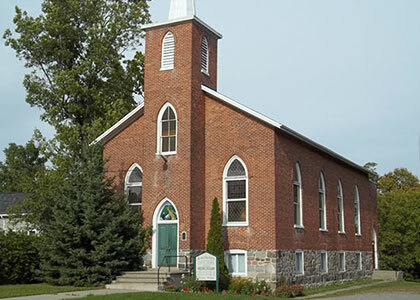 The Castleton Church was built in 1865 by Wesleyan Methodists, and it continued to serve the community’s spiritual needs 100 years later on its centenary, 124 years later when the building was designated by Cramahe Township, and it continues to thrive today, 151 years later. Built for $1,600.00, the church owed only $200.00 on the day of its opening and thanks to a collection taken that very day, the Castleton congregation could boast that their new church was debt free. was known for its avant-garde heating system, a basement furnace, in an era when most schools were heated with a box stove in the classroom. In 1930, the School was replaced by a much larger school on Spring Street and the building is now a private residence. The Castleton Cemetery was established by Joseph Keeler in the early 1800s. It is now one of the only cemeteries around with over 200 years of continuous use. 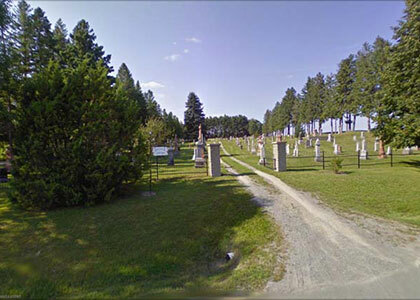 The Cemetery is administered by the Castleton Cemetery Board, under the guidelines of the Province of Ontario.